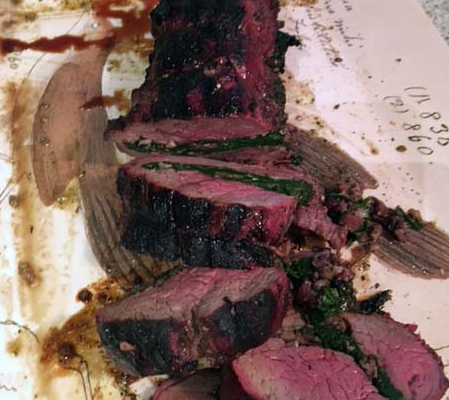 Hasty-Bake Smoked Spinach and Mushroom Stuffed Beef tenderloin recipe gives a boost of fresh flavor with a hint of garlic. 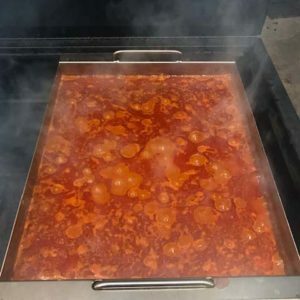 The perfect recipe to serve to your family and friends during the holidays. Stir in 1/2 cup of beef stock into large skillet, cook until liquid almost evaporates. Make sure to stir occasionally. Add spinach and cook for 1 minute or until spinach wilts. 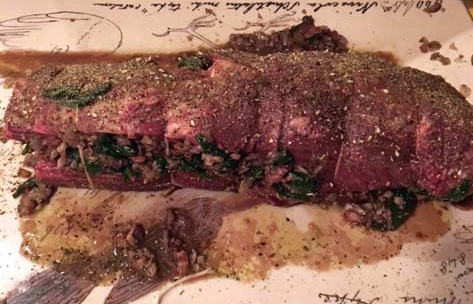 Spread the mushroom mixture evenly over the beef tenderloin and roll up beef using twine. Let rest for 10 to 15 minutes before digging in! Instructions: Heat a large skillet over medium heat on cooktop Add tablespoon olive oil to pan, swirl to coat Add bacon and cook for 2 minutes, stirring occasionally Add shallots and cook for 2 minutes, stirring occasionally Add mushrooms, cook for 3 minutes, stirring occasionally Increase the heat to medium-high Add garlic to the mixture. 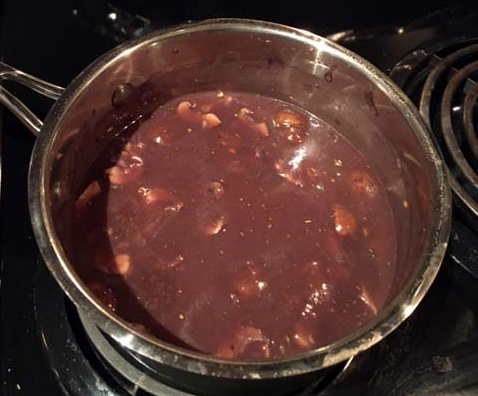 Saute for 30 seconds Stir in 1/2 cup of beef stock into large skillet, cook until liquid almost evaporates. Make sure to stir occasionally. Add spinach and cook for 1 minute or until spinach wilts. Fire up the Hasty-Bake Charcoal Grill to the desired temperature, 300 Degrees Cut the center of beef horizontally using a sharp knife. 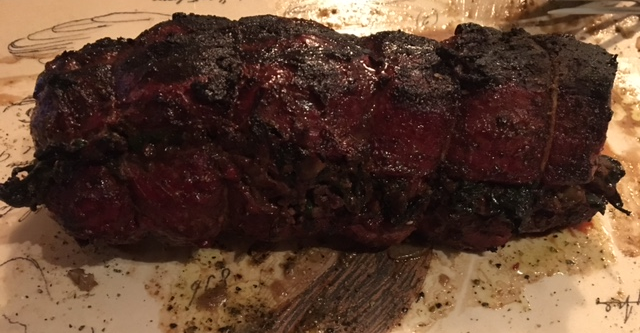 Open the tenderloin flat Drizzle olive oil over the side of the beef tenderloin Shake Hasty-Bake Gourmet Greek and ground black pepper inside Spread the mushroom mixture evenly over the beef tenderloin and roll up beef using twine. 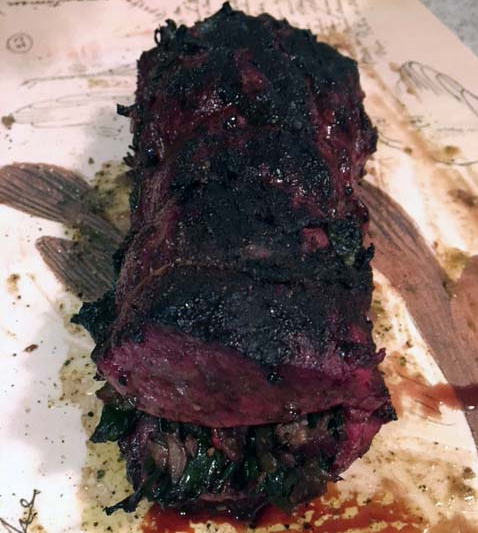 Secure the beef tenderloin with twine with 2-inch internals Repeat steps 12 and 13 on the outside of the beef tenderloin Desired Hasty-Bake Charcoal Grill internal temperature of 160 Degrees Let rest for 10 to 15 minutes before digging in!